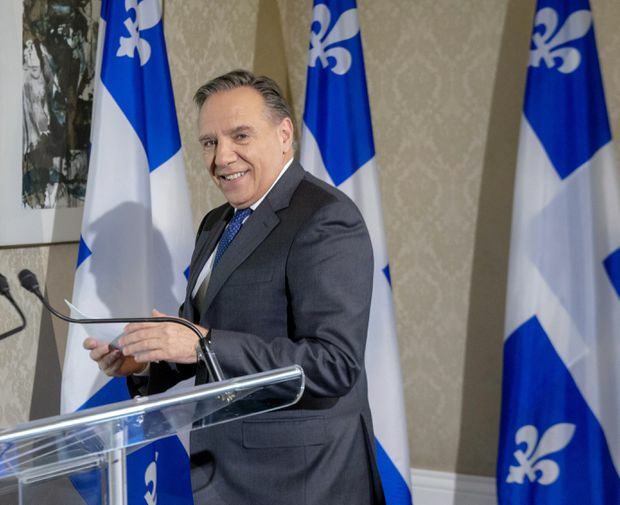 Quebec premier-designate François Legault speaks to the media on Tuesday after winning the provincial election. The CAQ, described by Mr. Legault as a right-of-centre party, is made up of federalists and former separatists, including Mr. Legault. Re Quebec Votes For Change (Oct. 2): The Quebec election is dramatic evidence of just how fickle voters can be. Liberal Premier Philippe Couillard did everything right. He not only stopped running annual deficits but started paying down the provincial debt. His cuts to social services, while unpopular, have resulted in a leaner, more efficient government. Mr. Couillard’s steady hand at managing Quebec’s finances turned a moribund economy into a success story, with record growth and low unemployment. What did achieving this prosperity bring him on election night? A kick in the pants – and a majority for an untested political party with a dubious platform. Re Ottawa Promises Farmers Full Compensation For Concessions (Oct. 2): So, all this fuss is over just 3.6 per cent of our dairy market? Can’t we just plaster Canadian flags and “hormone free” labels over local dairy produce? I think an awful lot of people will just continue to buy Canadian as they always have, and our coddled dairy industry will hardly feel a thing. I am dismayed by the dairy concessions. I would rather we had held out than concede on this issue. The U.S. dairy industry allows antibiotics and hormones, something I have been happy to avoid here. How could the government sell out the dairy industry in this way? I do not give one fig about the increased duty-free limits for Canadian consumers. The food I put on my table is far more important than online purchasing concessions. Re How USMCA Democratized Supply Management (Oct. 2): Food distribution professor Sylvain Charlesbois says Canada is the “only industrialized country in the world” where supply management still exists for dairy. The only one. Millions of Canadian consumers should not be forced to act like cash cows, paying artificial prices just so the “livelihood of roughly 300 to 400 more Canadian dairy farms” isn’t affected. Re Freeland, Warrior Princess (Oct. 2): The tone of this column makes it sound as if it were written in anticipation of a devastating loss for Canada in the NAFTA negotiation. Given the success of Chrystia Freeland’s efforts, Margaret Wente’s column could have highlighted Ms. Freeland’s initial charm offensive with members of Congress and those in Donald Trump’s inner circle. Their support proved critical. The column could also have noted her input to auto-content rules and wages. When left in the cold as negotiations continued between Mexico and the U.S. without Canada at the table, Ms. Freeland persisted. She called the American negotiators’ bluffs throughout September until they relented on the essential Chapter 19 dispute resolution mechanism. Chrystia Freeland the trade warrior made us proud in standing resolute for Canada and bringing home a deal to preserve Canada’s vital economic ties with the United States. Re Warmed Over (editorial, Oct. 1): President Donald Trump never promised to do anything about this century’s existential crisis, climate change, so it is not hypocritical for his administration to justify inaction by claiming that catastrophe is inevitable. Stupefyingly immoral, perhaps, but the real hypocrites are Canadians, who mostly believe climate change is happening but have done little to mitigate it. The deadly cost of our procrastination is becoming clear. If we don’t act decisively and now, it won’t matter whether we were immoral, hypocritical or even climate change deniers. We will all pay a terrible price, and future generations will rightly judge us all culpable. The UN says the world has the technology and can meet its greenhouse-gas reduction targets in a way that is economically feasible if it chooses to do it. Scotland has provided evidence of this by cutting its emissions almost in half from 1990 levels. Toronto is working toward its own target of 80 per cent reductions by 2050 using the TransformTO plan, which many view as achievable and which will also provide benefits to city residents. Knowing this and the fact that hundreds of millions of people are expected to be worse off if emissions are not substantially reduced, I would describe Canada’s continued expansion of fossil fuel development, such as the purchase of Trans Mountain, not as realistic but as negligent. As a departure from the seriousness of the trade issue, I’d like to mention a longtime (albeit somewhat trivial) pet peeve, namely that the word “acronym” gets misused a lot. USMCA is not an acronym. It’s an initialism. As both Oxford and Webster’s declare: an acronym is a word, usually pronounced as such, formed from the initial letters of other words – for example: NATO, NASA, radar. NAFTA qualifies as such. USMCA does not. I have been informed, by unreliable sources, that the name of the new trade pact – the United States-Mexico-Canada Agreement – has been a difficult issue from the beginning, and that settling for USMCA was actually a major concession by the United States. Their proposed name was initially the Terrific, Really, Unbelievably Magnificent, Perfect Agreement (TRUMP Agreement). Reflecting the importance and perfection of this agreement, each country would place the deal’s initials in large, gold letters on an national monument. The Canadian Parliament’s Peace Tower would have been renamed the TRUMP Tower. Canada would have been willing to accept this, but for its concerns there might be difficulty getting Congress to ratify the deal after the November midterm elections. Apparently NAFTA still exists: Not A Free Trade Agreement.